Cloud Computing has helped us understand both the opportunity, and the need, to decouple physical IT infrastructure from the requirements of business. In theory cloud computing greatly enhances an organization’s ability to not only decommission inefficient data center resources, but even more importantly eases the process an organization needs to develop when moving to integration and service-orientation within supporting IT systems. Current cloud computing standards, such as published by the US National Institute of Standards and Technology (NIST) have provided very good definitions, and solid reference architecture for understanding at a high level a vision of cloud computing. However these definitions, while good for addressing the vision of cloud computing, are not at a level of detail needed to really understand the potential impact of cloud computing within an existing organization, nor the potential of enabling data and systems resources to meet a need for interoperability of data in a 2020 or 2025 IT world. The key to interoperability, and subsequent portability, is a clear set of standards. The Internet emerged as a collaboration of academic, government, and private industry development which bypassed much of the normal technology vendor desire to create a proprietary product or service. The cloud computing world, while having deep roots in mainframe computing, time-sharing, grid computing, and other web hosting services, was really thrust upon the IT community with little fanfare in the mid-2000s. 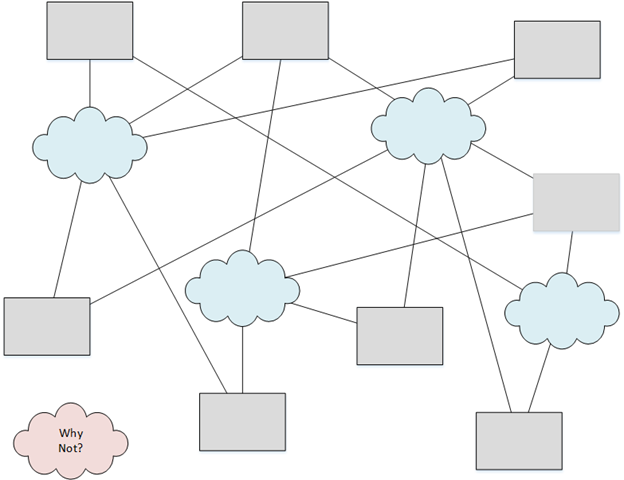 While NIST, the Open GRID Forum, OASIS, DMTF, and other organizations have developed some levels of standardization for virtualization and portability, the reality is applications, platforms, and infrastructure are still largely tightly coupled, restricting the ease most developers would need to accelerate higher levels of integration and interconnections of data and applications. “…the migration to cloud computing should enable various multiple cloud platforms seamless access between and among various cloud services, to optimize the cloud consumer expectations and experience. Very easy to say, however the reality is, in particular with PaaS and SaaS libraries and services, that few fully interchangeable components exist, and any information sharing is a compromise in flexibility. The alternative is of course an IT world that is restrained by proprietary interfaces, extending the pitfalls and dangers of vendor lock-in. The first thing is, the cloud consumer world must make a stand and demand vendors produce services and applications based on interoperability and data portability standards. No IT organization in the current IT maturity continuum should be procuring systems that do not support an open, industry-standard, service-oriented infrastructure, platform, and applications reference model (Open Group). The bottom line for all CIOs, CTOs, and IT managers – accept the need for service-orientation within all existing or planned IT services and systems. Embrace Service-Oriented Architectures, Enterprise Architecture, and at all costs the potential for vendor lock-in when considering any level of infrastructure or service. Standards are the key to portability and interoperability, and IT organizations have the power to continue forcing adoption and compliance with standards by all vendors. Do not accept anything which does not fully support the need for data interoperability. In 2009 we began consulting jobs with governments in developing countries with the primary objective to consolidate data centers across government ministries and agencies into centralized, high capacity and quality data centers. At the time, nearly all individual ministry or agency data infrastructure was built into either small computers rooms or server closets with some added “brute force” air conditioning, no backup generators, no data back up, superficial security, and lots of other ailments. The vision and strategy was that if we consolidated inefficient, end of life, and high risk IT infrastructure into a standardized and professionally managed facility, national information infrastructure would not only be more secure, but through standardization, volume purchasing agreements, some server virtualization, and development of broadband infrastructure most of the IT needs of government would be easily fulfilled. Then of course cloud computing began to mature, and the underlying technologies of Infrastructure as a Service (IaaS) became feasible. Now, not only were the governments able to decommission inefficient and high-risk IS environments, they would also be able to build virtual data centers with levels of on-demand compute, storage, and network resources. Basic data center replacement. Even those remaining committed “server hugger” IT managers and fiercely independent governmental organizations cloud hardly argue the benefits of having access to disaster recovery storage capacity though the centralized data center. As the years passed, and we entered 2014, not only did cloud computing mature as a business model, but senior management began to increase their awareness of various aspects of cloud computing, including the financial benefits, standardization of IT resources, the characteristics of cloud computing, and potential for Platform and Software as a Service (PaaS/SaaS) to improve both business agility and internal decision support systems. At the same time, information and organizational architecture, governance, and service delivery frameworks such as TOGAF, COBIT, ITIL, and Risk Analysis training reinforced the value of both data and information within an organization, and the need for IT systems to support higher level architectures supporting decision support systems and market interactions (including Government to Government, Business, and Citizens for the public sector) . “Infrastructure is a foundational element for enterprise architecture. Infrastructure has been traditionally provisioned in a physical manner. With the evolution of virtualization technologies and application of service-orientation to infrastructure, it can now be offered as a service. At first glance the SOCII standard appears to be a document which creates a mapping between enterprise architecture (TOGAF) and cloud computing. At second glance the SOCCI standard really steps towards tightening the loose coupling of standard service-oriented architectures through use of cloud computing tools included with all service models (IaaS/PaaS/SaaS). The result is an architectural vision which is easily capable of absorbing existing IT requirements, as well as incorporating emerging big data analytics models, interoperability, and enterprise architecture. Since the early days of 2009 discussion topics with government and enterprise customers have shown a marked transition from simply justifying decommissioning of high risk data centers to how to manage data sharing, interoperability, or the potential for over standardization and other service delivery barriers which might inhibit innovation – or ability of business units to quickly respond to rapidly changing market opportunities. 2015 will be an exciting year for information and communications technologies. For those of us in the consulting and training business, the new year is already shaping up to be the busiest we have seen. Providing guidance or consulting to organizations on cloud computing topics can be really easy, or really tough. In the past most of the initial engagement was dedicated to training and building awareness with your customer. The next step was finding a high value, low risk application or service that could be moved to Infrastructure as a Service (IaaS) to solve an immediate problem, normally associated with disaster recovery or data backups. As the years have continued, dynamics changed. On one hand, IT professionals and CIOs began to establish better knowledge of what virtualization, cloud computing, and outsourcing could do for their organization. CFOs became aware of the financial potential of virtualization and cloud computing, and a healthy dialog between IT, operations, business units, and the CFO. The “Internet Age” has also driven global competition down to the local level, forcing nearly all organizations to respond more rapidly to business opportunities. If a business unit cannot rapidly respond to the opportunity, which may require product and service development, the opportunity can be lost far more quickly than in the past. In the old days, procurement of IT resources could require a fairly lengthy cycle. In the Internet Age, if an IT procurement cycle takes > 6 months, there is probably little chance to effectively meet the greatly shortened development cycle competitors in other continents – or across the street may be able to fulfill. With IaaS the procurement cycle of IT resources can be within minutes, allowing business units to spend far more time developing products, services, and solutions, rather than dealing with the frustration of being powerless to respond to short window opportunities. This is of course addressing the essential cloud characteristics of Rapid Elasticity and On-Demand Self-Service. In addition to on-demand and elastic resources, IaaS has offered nearly all organizations the option of moving IT resources into either public or private cloud infrastructure. This has the benefit of allowing data center decommissioning, and re-commissioning into a virtual environment. The cost of operating data centers, maintaining data centers and IT equipment, and staffing data centers vs. outsourcing that infrastructure into a cloud is very interesting to CFOs, and a major justification for replacing physical data centers with virtual data centers. The second dynamic, in addition to greater professional knowledge and awareness of cloud computing, is the fact we are starting to recruit cloud-aware employees graduating from universities and making their first steps into careers and workforce. With these “cloud savvy” young people comes deep experience with interoperable data, social media, big data, data analytics, and an intellectual separation between access devices and underlying IT infrastructure. 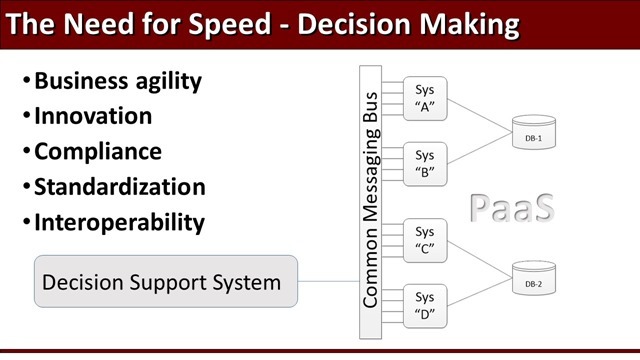 Now let’s consider the need for better, real-time, accurate decision support systems (DSS). Within any organization the value of a DSS is dependent on data integrity, data access (open data within/without an organization), and single-source data. Frameworks for developing an effective DSS are certainly available, whether it is TOGAF, the US Federal Enterprise Architecture Framework (FEAF), interoperability frameworks, and service-oriented architectures (SOA). All are fully compatible with the tools made available within the basic cloud service delivery models (IaaS, PaaS, SaaS). The Open Group (same organization which developed TOGAF) has responded with their model of a Cloud Computing Service Oriented Infrastructure (SOCCI) Framework. 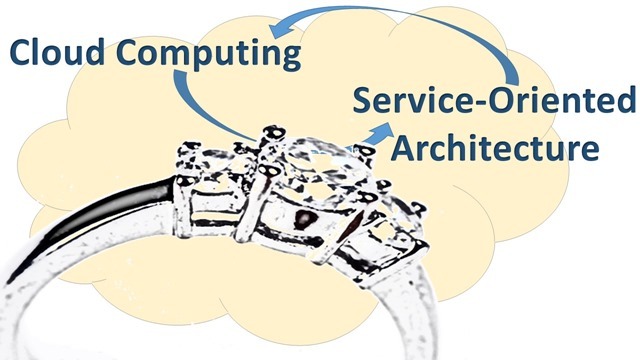 The SOCCI is identified as the marriage of a Service-Oriented Infrastructure and cloud computing. The SOCCI also incorporates aspects of TOGAF into the framework, which may drive more credibility into a SOCCI architectural development process. The expected result of this effort is for existing organizations dealing with departmental “silos” of IT infrastructure, data, and applications, a level of interoperability and DSS development based on service-orientation, using a well-designed underlying cloud infrastructure. This data sharing can be extended beyond the (virtual) firewall to others in an organization’s trading or governmental community, resulting in DSS which will become closer and closer to an architecture vision based on the true value of data produced, or made available to an organization. While we most certainly need IaaS, and the value of moving to virtual data centers is justified by itself, we will not truly benefit from the potential of cloud computing until we understand the potential of data produced and available to decision makers. The opportunity will need a broad spectrum of contributors and participants with awareness and training in disciplines ranging from technical capabilities, to enterprise architecture, to service delivery, and governance acceptable to a cloud-enabled IT world. For those who are eagerly consuming training and knowledge in the above skills and knowledge, the future is anything but cloudy. For those who believe in status quo, let’s hope you are close to pension and retirement, as this is your future.